Ollies are the most important trick you will ever learn if you want to skate stairs, gaps, rails, grind boxes and do flip tricks. It is a vital part of every trick you do and a scary trick to learn. When learning ollies, this may be your first time taking your board off of the ground. This, understandably can take some getting used to, but by following the tips below, you’ll be in the air in no time at all. Let’s take a look at how we go about learning to ollie. As the ollie is the most fundamental of skateboard tricks, you’ll likely learn the ollie before anything else. Therefore there are no prerequisite tricks required. You need to be comfortable on your board before you try ollies. 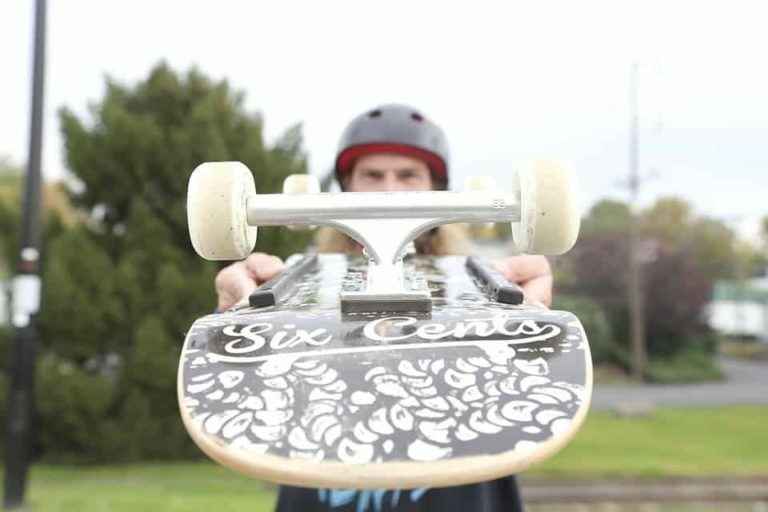 You’ll want to be able to push comfortably, skate in a straight line and know the basics controls of your board. Without these, you will struggle to do ollies because you don’t have a stable base to take off and land from. Once you have the basic controls down, you can start ollie-ing in no time! Follow these four basic steps and you’ll have your ollie perfected in no time. Persevere here, once it clicks you’ll be able to land an ollie every time without really thinking about it. Foot placement with ollies all depends on your size and the size of your board. 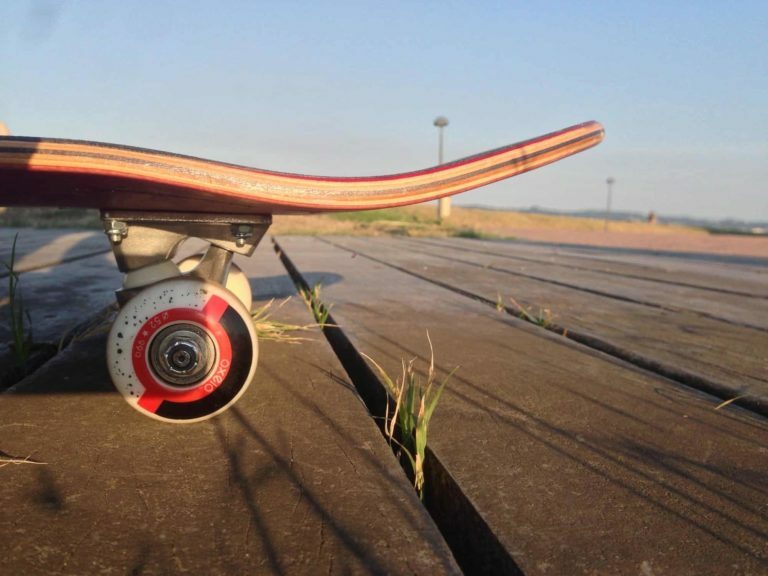 Ideally, you want your front foot just behind the nose bolts and your back foot bang on the tail where you put it when you are riding your board. If you are a little smaller and you’re using a big board, this position may not be comfortable for you. It might be worth getting a mini board so that you can stand in this position with your feet at about shoulder width apart. As long as your feet are about shoulder-width apart in this position, you’ll feel comfortable, stable and ready to learn ollies. 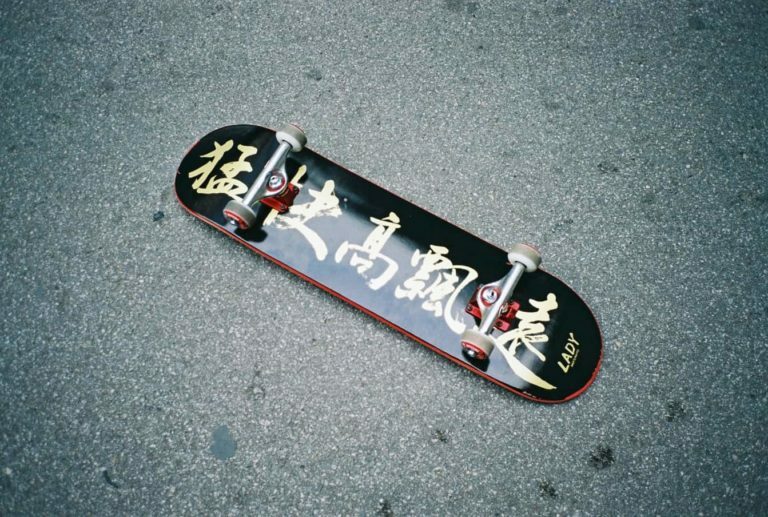 With an ollie, there are two stages of movement, but they have to happen almost precisely at the same time. The first movement is the snap or pop. This is where you bend, jump and force your tail to the floor. This has to happen quickly so that you can get off the ground. The second movement is the sliding of your front foot. After you have given an almighty pop with your back foot, you want to slide your front foot up the board. This is done with the side of your foot. The first movement, the pop, is to get your board off the ground. The second movement is to level the board out. Now, the timing of these movements is crucial. Of course, you may not get the timing of the pop and the slide right straight away, and that is fine. As long as you know that you need to do both of these movements and you work on them as you get more confident with ollies, you will get the hang of them. Typically, most people start doing small ollies so you probably won’t have much time in the air. However, you have enough time to look at your feet and see whether they are both on the board. With ollies, you want both feet on your board all the time. If one of your feet isn’t on your board, one of the movements you are doing isn’t strong enough. Typically, the foot most likely to come away from the board is your back foot. If your back foot comes off the board in the air, you aren’t popping high enough. So, when you notice that, pop a bit harder and this should solve that problem. You may need to ask a friend to help you with this step. Because you have started with your feet shoulder-width apart, your balance should already be centered over the board. This makes landing and rolling away from an ollie quite simple. As you are starting from a stable base, you’ll most likely land in a stable position too, with your feet almost shoulder-width apart again. As long as you perform both of the movements correctly, the pop and the slide, you will land and roll away smoothly, and you’ll have just done your first ever ollie. Ollies do take practice so don’t be disheartened if you don’t land one the first few times you try them. You have to practice the motions of an ollie and understand what is happening with the board in the air. When you pop the board, it starts heading straight up into the air. When you slide your front foot up the board, this levels it out again and brings the board back level with the floor. This may sound confusing to you now, but after trying ollies for some time, it will all make sense, this video tutorial does an excellent job of breaking down all the steps. Go out and give ollies a go. They are confusing, difficult and scary to start with, but once you know how to ollie, no obstacle is safe from you! Curbs, ledges, flat banks, quarter pipes, stairs, rails, and gaps will be yours to conquer. Once you’ve mastered the ollie you can start learning even more tricks. 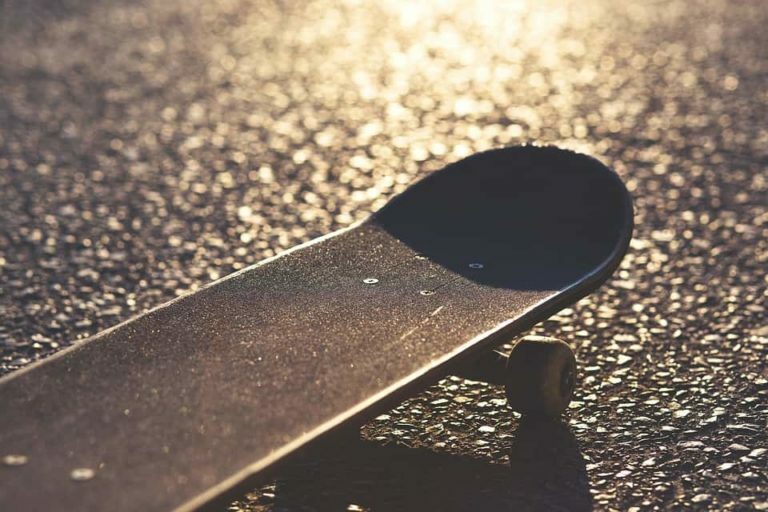 Some great tricks to learn after perfecting your ollie is the pop shuv-it, kickflips or heelflips.